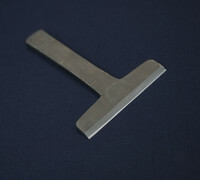 The Japanese hand plane (or kanna in Japanese), a tool used for shaving away surfaces of timber, comes in a wide variety of shapes and styles. 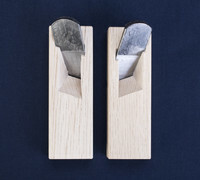 The choice of kanna depends on which part of the timber is being worked on. 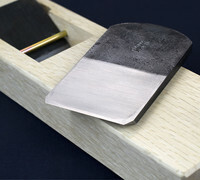 Kanna types with different functionalities include the Smoothing Plane / Hira-ganna, Block Plane (Ko-ganna or Mame-hira-ganna), Rabett Plane (Kiwa-ganna), Fanced Rabett Plane (Jyogitsuki-kiwa-ganna), Scraper Plane (Dinaoshi-ganna or Tachi-ganna), Groove Plane (Shakuri-ganna), Dovetail Plane (Ari-sakuri-ganna) and Chamfer Plane (Kakumentori-ganna). 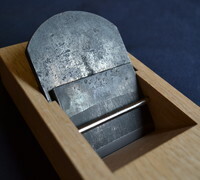 The kanna primarily consists of a metal blade (kanna-ba), a chip breaker (oshi-gane, ura-gane or osae-ba) and a wooden base or plane block (kanna-dai). 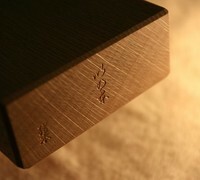 White oak (shiro-gashi) is the preferred material for making the base due to its hardness, but this is subject to the personal preference of the user. 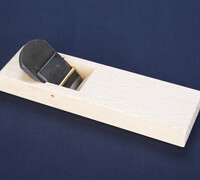 Please feel welcome to browse through our selection of fine quality Japanese hand planes, and contact us if you have any questions or don't see what you need.